Home > sports game > Everybody's Golf is so much fun, but why the nonsense open world stuff? Everybody's Golf is so much fun, but why the nonsense open world stuff? 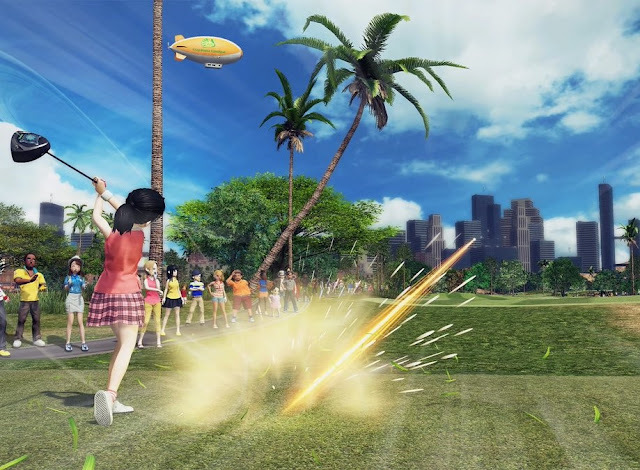 In the endless drive to socialise every game, Sony has taken its Hot Shots Golf (Everybody’s Golf outside of America) franchise - a series that has been incredibly popular over the years - and spun it into Everybody’s Golf, the Open World Golfing Simulator(™). Related reading: Mario Golf is very much like this one in terms of gameplay and style. Matt's review of the really excellent 3DS Mario Golf. Now you can wander around entire golf courses at your leisure, participate in leagues, and even join up with global teams to take on one another in intense golfing duels… to the death (okay maybe not, but there are persistent competitions going on). All this comes together to offer a game with potentially limitless replay value for people that get into the competitions and skill-based golfing action. For those of us who wanted a relaxed game of golf on the side… well, apparently we’re not that important. Yes there will be single player modes in the final game, but based on what I've seen from the Beta, any and all of that content will be an afterthought to the main event; the online, shared world, golfing experience. From the hands-on time that I got with the game’s Beta, I’ve got to say this; Everybody’s Golf is remarkably refined and basically ready to ship.. The courses are nicely designed, the characters have that bright and breezy cartoonish appearance that was so important in the series taking off in the first place, and everything about the game is catchy, bright, and instantly appealing. For this reason I can see even the most casual players getting stuck right into it, even as the gameplay systems themselves are surprisingly unforgiving. Hot Shots Golf was, right back at the start, a product of Camelot Software - the same crew that then went on to create the quite superb Mario Golf series. Though the development of Hot Shots moved to Clap Handz, the core gameplay remained the same, and for this reason I am now very, very familiar with the basic flow of all of these games; I sunk an unGodly amount of time into Mario Golf on the Nintendo 64 in particular. I found Everybody’s Golf to be instantly familiar, but also far more challenging than I’m used to. This new Everybody’s Golf is really quite unforgiving on the timing. 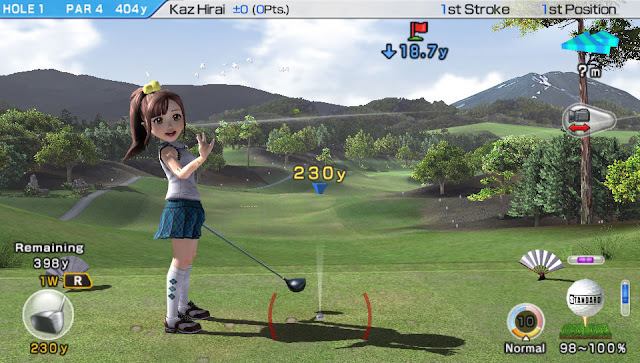 As with previous games, you’ll press a button to start a swing, press a button at the peak of the swing to determine power, and then press it again at the contact with the ball to determine direction and accuracy. This information is presented via an easy-to-follow interface, but if the timing of the swing is even slightly out, the ball has a habit of going places you never wanted it to. Like the water. Or the rough. This one time I did the rough then the water and felt like a right fool of myself. Of course with practice you’ll get closer and closer to nailing those perfect swings with frequency, and that’s when the excellent design of the courses will come in. From what I’ve played almost every hole is cleverly designed to have some kind of pitfall that will catch the unwary, and it does so in such a way that still looks believable as a golf course design. Because facilitating online competition was a clear goal of the developers, courses needed to have some kind of challenge so that the truly skilled would rise to the top of the pack, but despite this I never felt like the courses were so difficult that they’d seem impossible to a beginner, either. It looks like Clap Handz has managed the delicate balance required there with precision. All I can say that is disappointing is the focus on having stuff going on around you. Other players run into and out of view as you’re trying to play your own game. It’s not deliberate trolling, it’s just that the game has been designed around a shared golfing world. I don’t know about anyone else, but to me, when I’m in the mood for a golfing game, it’s either for local multiplayer, or to enjoy the sedate, relaxed pace of the sport by myself. Having players running every which way while I’m trying to concentrate is just a little too busy for my tastes, in this context. Related reading: For a more serious golf game, Rory McIlroy's your man. Matt's review of that one on PlayStation 4. We have enough games that already force players into immersion-breaking online play. And, for that matter, games with unnecessary open worlds for the sake of giving players spaces to “explore.” We didn’t need yet another example of either of those things in a golf game, in other words. I still expect Everybody’s Golf to me a real hit when it lands in stores recently. It’s just a very well made game. I just wish that I wasn’t effectively being forced to play with others to enjoy it.